These panels were created for a Christian School Fundraiser. They were both done on Roc-Lon fabric with a pocket sewn in the top for a rod. The edges were folded back and secured with glue. A few base coats are needed and a slight sanding to get rid of any nubs that pop up. I applied a real soft faux finish and when that was dried, I started stenciling! 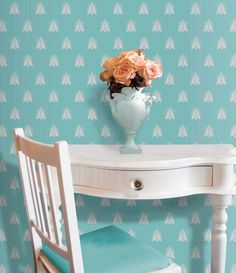 It is easy to create a tapestry look and you can have a lot of fun using some of the different border/molding stencils that are available. As for color selection, I used the colors that I used in many of the clients home in my area. I knew most of the people at the Fundraiser and had been in enough of their homes to know what colors would go. The first year I did this, a few people got into a bidding war. I had already discussed it with the auctioneer, so after the first one sold, he offered a second at the same price. I had an agreement with the school that I would do a second, all I asked for was my cost back and the rest I donated to the school. The good news, I had orders for 3 more of them. I did donate $50 each back to the school as well. Now, they ask me each year to do a piece. It has been a great way for me to give to my community and a great way to promote my business in my area. Never Enough Time Creations is located southwest of Houston, and Karen Sabrsula’s artwork and design can be found in homes throughout the Greater Houston area.